You never forget your first love…or your first oyster roast. A high school seafood monger, I spent much of my formative years serving endless pounds of raw and steamed shrimp, scallops, clams, oysters, fish, crabs and lobsters to voracious hordes at Hadfield’s Seafood Market in Wilmington, Delaware. It was a traumatic experience—I still bear a physical scar from falling on a bag of live crabs while navigating an icy walkway between coolers. Although I preferred my tuna from a can and despised most other forms of seafood, I thought I knew almost everything about the “fruit of the sea.” Yet, I was woefully unprepared for the social rules, pageantry and collective insanity of a Lowcountry oyster roast. On my way to Atlanta after college graduation with dreams of finding a “real job,” I stopped to visit my grandmother at her retirement community on Hilton Head Island. I was allowed to stay in her apartment for six weeks and, 25 years later, I still haven’t left the Lowcountry. Dinner at The Seabrook was a grand affair. Men were expected to wear jacket and tie, delicious entrees were ordered from a printed menu, a dessert buffet showcased a selection of high-calorie treats and a social pecking order determined where and with whom you were seated. A young adult in their midst was a novelty and my grandmother’s innate coolness soared to new heights as other residents vied to sit at our table. Thanks to the dessert buffet, I gained 10 pounds over those six weeks, but became good friends with one of the dining room waitresses. A few weeks into our friendship, she invited me to her family’s holiday oyster roast. My grandmother was uncharacteristically giddy about the invitation, as if I was going to a grand gala. “You’ll need to bring an oyster knife,” she declared while rifling through her kitchen drawers in search of said utensil. Now, my mother was a Rock Hill debutante who instilled manners in my sister and I from a young age and I don’t ever recall being given a weapon before heading out to a social event. However, Grandma possessed an unerring sense of propriety, so I slid the short knife with its bulbous handle into my purse and set off across the bridge to Buckingham Landing. My grandparents moved to Hilton Head Island in the 1970s, but we had rarely explored Bluffton and its environs. Buckingham Landing, where the ferry from Hilton Head used to dock before the bridge was built, was like entering a different world. Traveling along a dirt road in pitch-black darkness, I only found the house because of a fire burning in the backyard and a dozen adults milling around holding beer in one hand and knives in the other. Country music blared and children stood around the fire holding red-hot spears topped with flaming marshmallows or smoking hot dogs. Seamlessly blending in with my Philly accent and noticeable lack of shucking skills, I learned a lot at my at my first Lowcountry Oyster Roast. 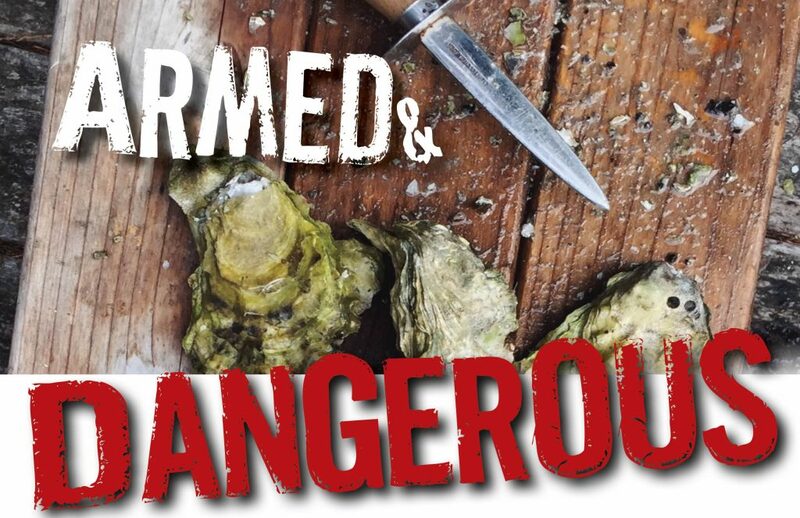 First, common courtesy dictates a host demonstrate opening an oyster or two for the uninitiated, otherwise a guest may starve or suffer serious injury from a self-inflicted stab wound. Second, if your beverage of choice is beer or something stronger, bring your own koozie, thermos or red Solo cup, so as not to offend non-drinking Baptist friends and family. Most importantly, an oyster roast is not necessarily about the food, but rather the camaraderie built standing around a fire or oyster table on a cold night sharing a meal and tales which grow taller with each retelling. Fast forward 15 years and I’m married to a Lowcountry man who owns exactly two butter knives—the others were destroyed shucking oysters. We now host our own oyster roasts on a dirt road on the outskirts of Hardeeville complete with a blazing fire and white dishtowels purchased for the sole purpose of holding steaming hot oysters taken off the custom-designed metal roasting tray. Our son mastered the art of shucking at a young age and will gladly teach you the technique. Just don’t forget your oyster knife.